When you install Workstation on a Windows or Linux host system, a bridged network (VMnet0) is set up for you. 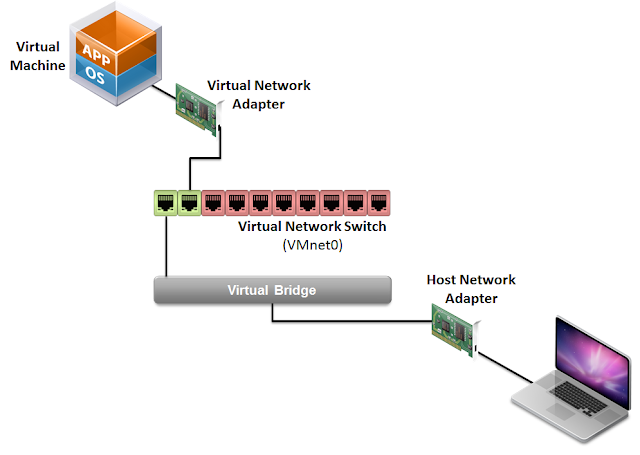 Bridged networking connects a virtual machine to a network by using the network adapter on the host system. If the host system is on a network, bridged networking is often the easiest way to give the virtual machine access to that network. With bridged networking, the virtual network adapter in the virtual machine connects to a physical network adapter in the host system. The host network adapter enables the virtual machine to connect to the LAN that the host system uses. Bridged networking works with both wired and wireless host network adapters. Bridged networking configures the virtual machine as a unique identity on the network, separate from and unrelated to the host system. The virtual machine is a full participant in the network. It has access to other machines on the network, and other machines on the network can contact it as if it were a physical computer on the network. You can view and change the settings for bridged networking on the host system, determine which network adapters to use for bridged networking, and map specific host network adapters to specific virtual switches. A virtual machine must have its own identity on a bridged network. For example, on a TCP/IP network, the virtual machine needs its own IP address. Your network administrator can tell you whether IP addresses are available for virtual machines and which networking settings to use in the guest operating system. Typically, the guest operating system can acquire an IP address and other network details from a DHCP server, but you might need to set the IP address and other details manually in the guest operating system. IMP NOTE: Users who boot multiple operating systems often assign the same address to all systems because they assume that only one operating system will be running at a time. If the host system is set up to boot multiple operating systems, and you run one or more operating systems in virtual machines, you must configure each operating system to have a unique network address. When you install Workstation on a Windows or Linux host system, a bridged network (VMnet0) is set up for you. If you install Workstation on a host system that has multiple network adapters, you can configure multiple bridged networks. For example, if the host system has two network adapters connected to two different networks, you might want virtual machines on the host system to bridge to both network adapters so that they can access either or both physical networks. Verify that a network adapter is available on the host system to bridge to. If VMnet0 is bridging to all of the available host network adapters (the default setting), you can modify it to make an adapter available. On a Windows host, log in as an Administrator user. 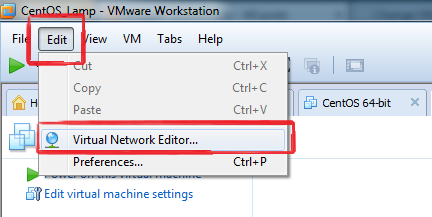 Only an Administrator user can change network settings in the virtual network editor. On a Linux host, log in as root. You must enter the root password to access the virtual network editor. Select Edit > Virtual Network Editor. Click Add Network and select a network to add. 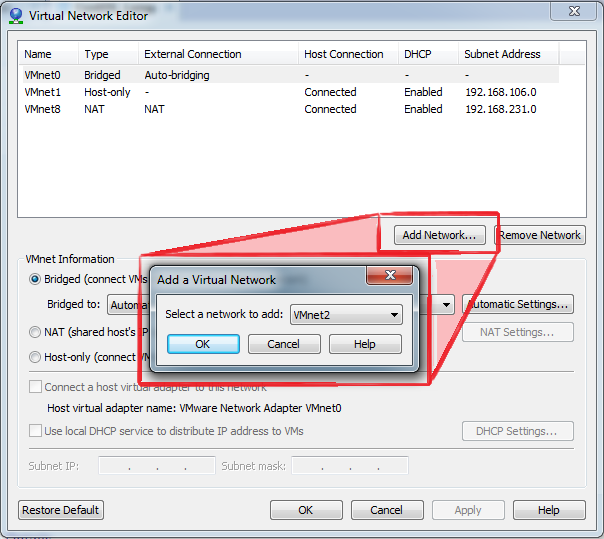 You can create a custom bridged network on VMnet2 to VMnet7. On Windows hosts, you can also use VMnet9. On Linux hosts, you can also use vmnet10 through vmnet255. 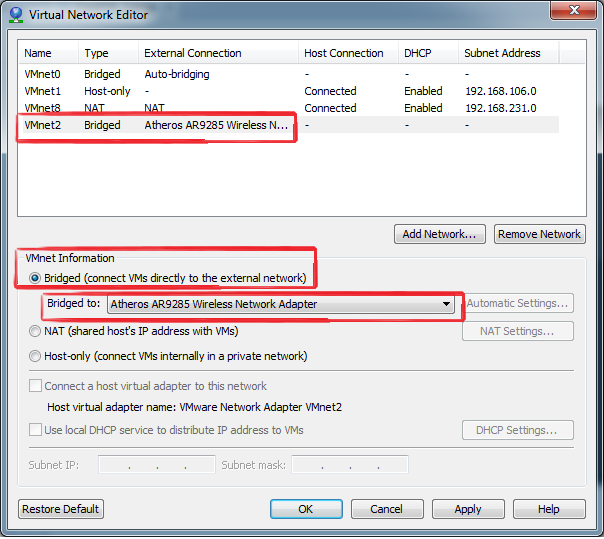 Select the new network and select Bridged (connect VMs directly to the external network). Select a host network adapter to bridge to from the Bridged to drop-down menu.